Video highlights from Discovery's final full day in space for STS-120. Flight Day 14 was undocking day as Discovery depated the station to begin the journey toward home. The shuttle Discovery astronauts say goodbye to their space station crewmates on Flight Day 13 of the STS-120 mission. Spacewalking astronauts come to the rescue and repair the station's damaged solar array. Highlights are packed in the Flight Day 12 movie. Towering more than 230 feet tall and packing nearly two million pounds of thrust from its three hydrogen-fueled main engines, this rocket is built to loft big payloads. And the roomy nose cone offers spacious accommodations for exceptionally large spacecraft. The Delta 4-Heavy's characteristics make it well suited for launching a Defense Support Program (DSP) missile warning satellite into geosynchronous orbit 22,300 miles above the planet. But in its lone previous flight three years ago, the Heavy encountered an unexpected problem within its fuel lines, causing the engines to snuff out a few seconds early and leaving the rocket well short of the intended orbit. That December 2004 launch was only a test, an Air Force-financed demonstration flight designed to uncover the unknown flaws in the system before expensive and vital national security payloads were entrusted to the big booster. "It's always better to find a problem than to have a latent and yet-to-be-discovered (problem). That's part of why we considered the Heavy demo such a success. It was a very subtle problem, but we found it and we fixed it," said Col. Jim Planeaux, the Delta group commander at the Space and Missile Systems Center. The test rocket was outfitted with vast amounts of data-collecting sensors to understand all aspects of the ascent, leading to some other changes before the first operational launch. "We took a lot of readings on accelerations, vibrations, acoustics in the various compartments of the vehicle. In a few cases (we) determined that they were higher than we expected and we either modified the hardware slightly or moved some of the components to a more benign environment. We finished all of those (modifications) late last year, and we're very comfortable with the vehicle we've got." Rocket-maker United Launch Alliance and the Air Force, both confident that the Heavy was ready for a real mission, fired off the rocket from Cape Canaveral in Florida at 8:50 p.m. EST (0150 GMT) Saturday evening. Hidden inside the long metallic nose cone rode the Defense Support Program 23 spacecraft, the last in a series of eye-in-the-sky satellites designed to spot enemy missile launches and nuclear explosions. DSP satellites have been flying since November 1970, rocketing into orbit aboard various versions of now-retired Titan rockets and the space shuttle. This final one -- DSP 23 -- has been waiting more than two years for the new Heavy to hoist it into space. The Delta 4-Heavy is created by taking three Common Booster Cores -- the liquid hydrogen-fueled motor that forms a Delta 4-Medium's first stage -- and strapping them together to form a three-wide rocket, and then adding the powerful upper stage. Each 15-story booster core features a Pratt & Whitney Rocketdyne RS-68 main engine that generates 650,000 pounds of thrust while burning supercold liquid hydrogen and liquid oxygen propellants. The cryogenic upper stage has the Pratt & Whitney Rocketdyne RL10B-2 powerplant. As the countdown entered the final seconds, liquid hydrogen rushed through the three RS-68 engines and then the powerplants roared to ignition. A massive cloud of fire raced up the rocket, creating a visually awesome but terrifying display. A dozen explosive bolts holding the vehicle to pad 37B detonated as clocks struck zero to free the Heavy to begin climbing as three launch pad swing arms pulled back. Data from the test flight showed the ignition fireball created hot temperatures around the nose cone, leading to another change for the DSP satellite launch. "We've done a lot of thinking about it since (the test). It does get pretty hot up around even the payload vents. So to mitigate that, we've added some modifications to this particular payload fairing to essentially keep the plume out as the vehicle rises and still allow the payload compartment to vent properly," Planeaux said. "When you've got a payload that's very sensitive to contamination, we had to go through some fairly elaborate measures to ensure we were well protected there." The three identical main engines, the world's largest hydrogen-fueled rocket engine and each capable of generating 17 million horsepower, propelled the vehicle into a clear night sky with three distinct red-hot plumes trailing more than 200 feet long. About 50 seconds into flight, the center Common Booster Core's engine was throttled back to its minimum power level of 57 percent thrust to conserve fuel that became important later. The starboard and port boosters continued firing at full throttle -- 102 percent thrust -- through the launch's first four minutes before emptying their liquid hydrogen and liquid oxygen propellant tanks and shutting down the RS-68 engines. The boosters peeled away and plummeted into the Atlantic Ocean. Once the outer boosters were shed, the center stage finally throttled back up to 102 percent for more than a minute of propulsion, consuming that fuel supply saved during the period of reduced thrust. The stage was jettisoned about five minutes, 40 seconds after liftoff, leaving the rocket's upper stage and payload to continue the journey to orbit. About 13 minutes into flight, the upper stage completed its first burn to achieve an initial parking orbit above Earth and entered an hour-long coast mode until it reached the extreme western Pacific Ocean northeast of Australia. That is where the RL10 engine was re-ignited to reach a geosynchronous transfer orbit stretching 22,000 miles at its high point. The stage then coasted in this orbit, eventually reaching the apogee where the RL10 engine was fired for a third time starting at T+plus 6 hours, 10 minutes. The three-minute burn circularized the orbit over the equator off the western coast of South America. 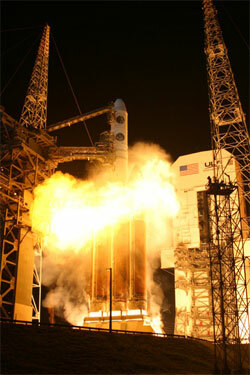 At 3:09 a.m. EST, the 5,179-pound DSP satellite was released from the Delta 4-Heavy rocket to complete the launch. "Last night's successful countdown and flight culminate a tremendous amount of hard work by the entire Air Force launch team and our industry partners. Congratulations to all who made this challenging and spectacular launch of the DSP 23 satellite a reality," Planeaux said. "As the first operational launch of a Delta 4 Heavy Lift Vehicle, it marks a major milestone accomplishment for the EELV program and for assured access to space." Bringing the Heavy version of the Air Force's Evolved Expendable Launch Vehicle family into operational service, the military has now successfully replaced the retired Titan rocket fleet for deploying large satellite payloads. "This success highlights the continued maturization of our EELV program," said Brig. Gen. Susan Helms, 45th Space Wing commander at Cape Canaveral. 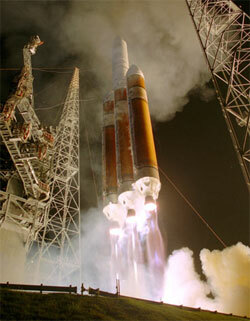 Another Heavy is next up on the Delta 4's launch schedule. An April liftoff is planned from Cape Canaveral to deliver a classified spy satellite into orbit for the U.S. National Reconnaissance Office. Officials plan a five-month gap between Saturday's flight and the subsequent launch while engineers complete a thorough review of data. 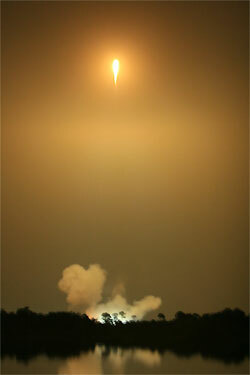 "That has a five-month standoff to digest all of the analysis and redo all of the loads for the payload. But we look forward to not taking any more time than that to launch NROL-26," said Mark Wilkins, United Launch Alliance vice president for Delta Programs. Another secret NRO launch using a Heavy from the Cape is planned in 2009, followed no sooner than 2010 the first Heavy flight from California's Vandenberg Air Force Base with another NRO payload. Outfitting of that West Coast pad to install equipment for the larger rocket has begun. 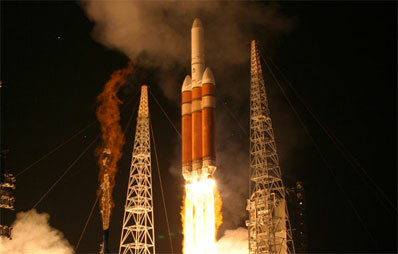 For more on Defense Support Program 23 satellite launched Saturday night, see our separate story here.